Are you growing profitable relationships using LinkedIn? LinkedIn is one of those social networks that has a lot of rabid fans – but also a few detractors who scratch their heads on the non-resume posting / job searching capabilities of the site. Guilty confession: I was one of the latter, until recently re-connecting with some of the great updates and cool features LinkedIn has to offer. Knowledge sharing tool extraordinaire – With so many places to share your insights, content of note and other great media (think articles, events, notes, thoughts on recent events, etc.) LinkedIn makes it easy for you to keep you name in connections’ minds and give you another platform to be appreciated as a valuable and relevant relationship. Be generous and interesting – it will come back to you in spades (or search engine rankings, at the very least). Uber-awesome search engine – LinkedIn gives you some pretty remarkable Advanced search features that enable you to narrow down your searches to zip code, job title, keywords, industry and oh-so-much more. Go crazy searching through your 2nd degree connections (that is, your own connections’ connections) or search the LinkedIn database at large. Magical time machine! – By including all of your education and previous work experience, LinkedIn can help you locate former colleagues, associates, clients and school buddies. Don’t forget to include your high school too. Your old high school flame might be an industry pioneer and your old physics teacher might be a CEO – don’t lose those valuable opportunities! Additional membership benefit – LinkedIn groups are a great way to get more out of your professional memberships by giving you a single location to share ideas, events and needs with a select group of people that you know, trust and (hopefully) like. You can also leverage groups for special interests you share (motorcycle maintenance or hang gliding) to find like-minded folks to connect with in an out-of-the-ordinary way. Don’t forget those alumni and church groups too! The ultimate due diligence tool – There is no place like LinkedIn to track a company, association or individual’s updates and news. Plus you get to read between the lines by seeing a firm’s attrition rate, recently updated press release and employee discussion. Take advantage of this information and use it to be helpful and awesome. During this presentation, I make the suggestion of re-working your morning office routine to include a 5 minute review of your Linked connection / groups / companies updates with coffee. With LinkedIn’s ‘LinkedIn Today’ headline tool, you can even read up on the news that actually matters to you by subscribing to specific news sources and topics. I would do myself and this company a disservice if I didn’t take time to thank the people at Schipul. I believe everything happens for a reason and words cannot describe how much of a lifesaver this company has been in my life since I heard about it at the beginning of this year. I graduated last year at Famu in this horrible economy and found it hard to find any type of employment as many recent graduates did. I worked a lot of odd jobs that were only temporary and that weren’t enjoyable. Through this tough time I started to get back into freelance web design as a way to keep some type of income and reconnected with Albert Hughes for consulting. Reaching out to him I found out that he was employed at Schipul and he was more than generous to help me out. From there I researched the company and felt that it would be an awesome place to work. I liked the young energetic attitude the employees had, I liked the training they offered, and who wouldn’t want to work at a company when the first thing you see when you walk in is a Nintendo Wii? I applied for a SEO internship position but didn’t get it, but it turned out to be a blessing, because I know I wasn’t ready and I needed to do more research and practice on my own. Although my web design skills were not perfect, I felt like I was more prepared when another internship position came up. It came at a perfect time because plans for grad school weren’t working out, and I was at the end of my rope. Some people might not have Faith that good things follow the bad, but I do. As a result I was in the exact place at the exact time for me to apply and enjoy my current internship on an interactive client team at Schipul as much as I do. Now I’m with a group of people who care and want to teach you. I love our clients and atmosphere and I am fortunate to say that I am at my dream job. Not many people in life have the opportunity to say that. I’m blessed enough to say that on my first REAL job. So thanks to Schipul for letting me experience this. Have you ever gone for a nice leisurely jog and thought to yourself, ‘I need to run with purposeâ€¦I need to run for a causeâ€¦I need to run for a REASON! Then, all of a sudden your chin has lifted. A montage of you crossing the finish line next to Richard Simmons begins to scroll through your head accompanied by the sound of angel harmonicas and fairy flutesâ€¦you my friend, have become a hero. Of course this will all come to a screeching halt when you realize you have just run through a big pile of dog poo. No need to fretâ€¦that dream can still be yours my little monkeys. If you missed the deadline to sign up for the Chevron Houston Marathon you have the opportunity to still register for the Heroes Fundraising Programâ€¦and possibly still cross the finish line with Richard Simmons. In order to enter as a ‘Hero,â€ you must raise $350 which will be a direct donation to the Run for a Reason charity of your choice. Houston Humane Society is a non-profit animal shelter dedicated to eliminating cruelty, abuse, and the overpopulation of animals. HHS is committed to creating the awareness of animal rights throughout the Houston community by providing numerous animal welfare programs for Houston area residents and their pets. Neuhaus Education Center is dedicated to providing professional development for educators in research-based methods of literacy instruction. In addition, the Center is a resource for parental consultation and for adults seeking literacy education. Pink Ribbons Project was founded by a group of dancers who were individually touched by breast cancer. Using the arts, Pink Ribbons Project saves lives and improves the quality of life for those touched by breast cancer. You will not only have the honor of becoming a Hero for a great cause, but you will receive some pretty nice swag. You will be given a custom ‘Heroâ€ back bib, tech fabric cap, an invitation to the exclusive post-race charity event and recognized as a Hero on the Chevron Houston Marathon web site. Famous. So come on all you galloping stallionsâ€¦stop running in dog poo…and start Running for a Reason. For more information on the Heroes Fundraising Program, prices and deadlines visit the Chevron Houston Marathon website. Thanks alangham for the great pic! 2. An expression from the mid 1950s, which fell from favor by the early 1960sâ€¦.until now. Hey dude, do you know Reggie Bibbs? I heard his blog is so boss. As I stand sit here, amongst a sea of people, adorning my wizards’ cloak and wand, I feel the need to rise upâ€¦for today marks the start of something glorious! No, they have not finally captured the French Big Foot named Clouseau and put him on display in Canada. Come on dude. This friends, is the beginning of a new eraâ€¦a place where bloggers can be exalted for a job well done. A place where I can sit here every month and say…This Blog is So Boss. Like all historic revolutions, I must start out with a bang followed by a little pow. Hell, let’s throw in a 540 tornado kick, landing in a roundout back flip – blindfolded. It’s true, some blogs just have that affect on people, and ninja moves aside, I am honored to feature a local Houston blog, ‘Neurofibromatosis CafÃ©â€ as the boss blog of the month. So what you’re saying is there’s a new place in town for coffee and tweet-ups? Coffeegroundz what? Unfortunately noâ€¦ but there is a man named Reggie Bibbs. Reggie was born with neurofibromatosis (NF) which is a genetic disease that causes him to develop tumors on his body. He began this blog, along with long-time friend Lou Congelio, president of STANANDLOU Advertising, to spread the word of NF. I recently had the opportunity to speak with Reggie and it became one of those moments where you think to yourselfâ€¦so this is what life is all about. His passion and spirit were infectious as he spoke about what his blog has provided for people. And as they sayâ€¦the rest is history. The Just Ask campaign went on to win 2 gold ADDY awards, one silver, and a Special Judges Award for Public Service Advertising. I would never claim to be an advertising genius, or a pro unicorn jouster for that matter, but I do know that the Just Ask ads were absolutely spectacular and the well earned recognition could not have happened to a better guyâ€¦that’s you chief. Reggie is also lucky enough to have Lou, along with two other of his close friends, William and Matt contribute to the blog. These guys have not only helped document Reggie’s experiences but they have played a huge part in bringing NF to the forefront. No doubt about it, Reggie has definitely become the man about town. Through his blog posts, you can see what an impact Reggie is making in the community. He has spoken across the country for other NF Foundations where his most recent trip was to Grand Rapidsâ€¦next stopâ€¦Canada. Here’s a fun fact: I am a ninja and can fit in medium-sized suitcases; specifically designed to fly to Canadaâ€¦I’m just sayin’. When he is not traveling, you can see him at the Houston Roller Derby, meeting with political figures, chummin’ it up with Kevin Nealon, starting the dance revolution at Music Nitesâ€¦really, the list goes on and to be quite honest, I’m not yearning for carpal tunnel anytime soon so I will bid adieu. But before Iâ€¦ ‘do,â€ I want to leave you with one final thought from a man who used something as simple as a blog to create a movement and therefore inspire others to simply be thankful. *The photo was apart of the award-winning ads recognized at the 2009 ADDY Awards. Thanks again Reggie! You truly are an inspiration. Have you checked the back door lately? “Re-marketing” is knocking. Any professional woman that can make a large crowd chuckle uncontrollably with the mention of a plumbers’ crack is pretty much my hero. Who is this delightful woman you ask? Suzanne Penley, CEO of Customer Focused Systems, a full service consulting, management and training firm. She recently spoke at the monthly AMA luncheon about the power of “re-marketing,” and I have to say it has been my most enjoyable to date. Suzanne explained the fact that we are constantly trying to open new doors, but have you ever thought to check the back door? Personally, I think some of us are still spinning in the revolving door but that’s neither here nor there. ‘Checking the back doorâ€ can be as simple as calling a current client to see how they boded over at the ‘World Conker Championships.â€ That phone call had nothing to do with your productâ€¦but you have opened the back door to continued business. Do NOT underestimate the element of surpriseâ€¦it’s a powerful tool and can often come down to whether you keep a client or not. 1. Reliability: Take McDonald’s for example. You can go to a McDonald’s in Texas, Minnesota or even in Kiev, Ukraine and have the same exact meal. 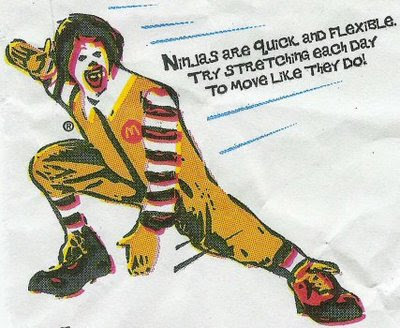 Granted, the happy meal toy and hamburger meat may vary depending on dining location, but the good news is…Ronald McDonald is still a ninja. The point I am trying to make here is McDonald’s has built their business around being reliable and it has worked. Suzanne put it in prospective when she said, ‘Don’t cut back on your main ingredients.â€ Continue to offer the same service that you offered in the beginning, don’t cut back…not even a little bit. What if I went to Starbucks everyday and ordered a caramel macchiato with whip cream on top, but one day they forgot the whip cream. That’s fine, it’s just one day. To my dismay, they continued to forget for an entire weekâ€¦you better believe I am taking my business elsewhereâ€¦all I wanted was some whip cream people! 2. Responsiveness: Clearly outline what customers can expect from you and stick to it. If you promised string cheese, a purple skip-it and a light saber, well by golly you better give them string cheese, a purple skip-it, a light saber AND a complimentary Dallas Cowboys key chain. 3. Empathy: This was the most important trend and according to Suzanne, one of the leading sales and marketing techniques today. People enjoy doing business with people they like. Stop telling people you are the bestâ€¦show them that you are the best. Here’s an idea, be human! Nobody wants to discuss a business deal with a robot, and to be quite honest, I don’t trust anything that can’t perspire and enjoy a nice bubble bath. Here’s the deal folks…existing clients are like your lovable grandma Camilleâ€¦she’s old and repeats the same story about how she tooted trying to build a trampoline one Christmas, but if you listen to her and give her a call every now and then, she will always have fresh cookies waiting for you on the table. Thank you for the awesome photo Jeremy Brooks!